Her energy and passion for fashion and hand-made items have led Cinzia to open her own business, with a spirit of craftsmanship as her flagship but without neglecting to pay attention to detail. The name of her project is Coccinella laboriosa; it originated out of the a play on the initials of her name and surnames. After having begun by creating costume jewellery, Cinzia went on to doing cross stitch embroidery, but it wasn't until she tried different techniques that she ventured into doing magnificent things such as the woollen bags shown in the picture above. From there her project has taken another turn, opening up a whole host of possibilities consisting of little chains, handles and even badges! 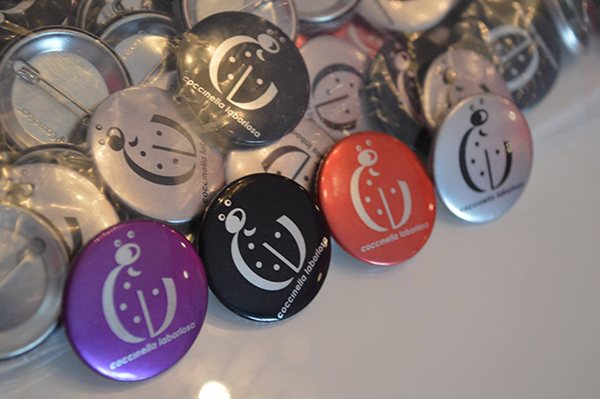 Cinzia has explained that her idea of adding badges to the bags comes from wanting to give them a touch of uniqueness. It so happened that she had a badge to hand when she thought of it, and at that moment the penny dropped!